Today is the last day of the 2018 Our Lady of the Lake Children’s Hospital Mediathon! Tune in to 96.1 FM The River, 102.5 FM WFMF, 101.5 FM WYNK, 97.7 FM and 1150 AM WJBO on your radio dial or watch WAFB-TV Channel 9 for live coverage from Our Lady of the Lake Children’s Hospital. Additional coverage will provided by The Greater Baton Rouge Business Report, 225 Magazine, and InRegister Magazine (including an inside look at the new children’s hospital). 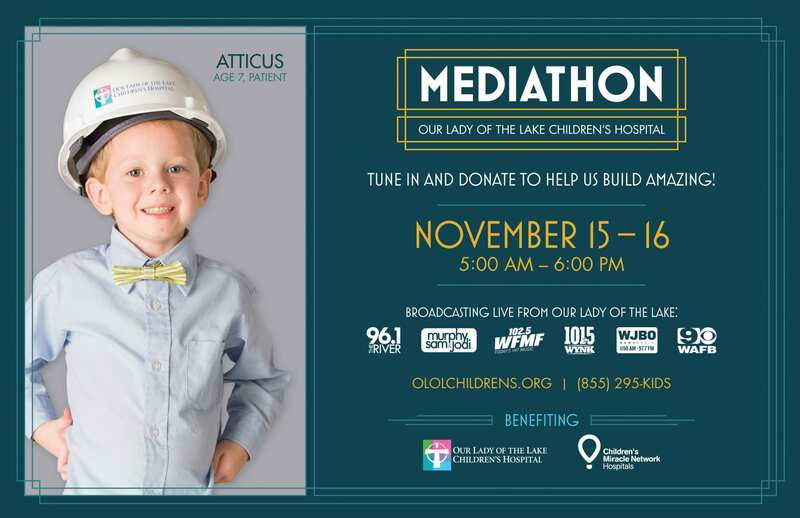 Mediathon is a 2 day collaboration of Radio, TV and Print media partners, fundraising together on November 15-16 with the goal of raising as much money to advance lifesaving care and help build the new freestanding Our Lady of the Lake Children’s Hospital. You can donate at www.ololchildrens.org/Mediathon, or call toll-free 855-295-5437 or text LAKIDS to 51-555 (Standard Message and Data rates may apply). Become a Miracle Maker for #AmazingKids by pledging $15 or more per month or make a one-time donation of any amount. Check out a sneak peak of the new Our Lady of the Lake Children’s Hospital from Day 1 of Mediathon 2018. A sneak peak of the new Our Lady of the Lake Children’s Hospital with Scotty Mac of 96.1 The River. Previous post: Baton Rouge Area Credit Unions Raise Over $54,000 For The Kids!